Display Cases for highend retail stores and shops all over the USA and Canada. Imagine walking through 5th avenue and being captured by the perfect bag on display inside incredible looking display cases. 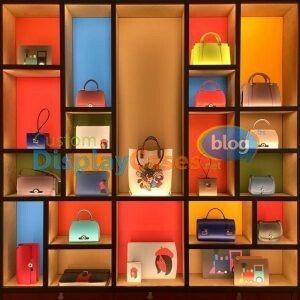 We can assure you that your first glance was provoked by a very good display case design. Our friends in Gucci needed some elegant and premium cases to be build to display a newly designed accessories line at their store on 5th avenue, where lots of customers are delighted to see what is on display just by walking by the store window. You think we only have standard designs? We can inform you now that you have been wrong all this time! We can design anything you and your business might need and give that same impression Gucci gives it’s customers in New York City.